Looking for some good restaurants near Spanish Steps? Get the scoop on the best places to eat and drink in Rome's shopping zone. 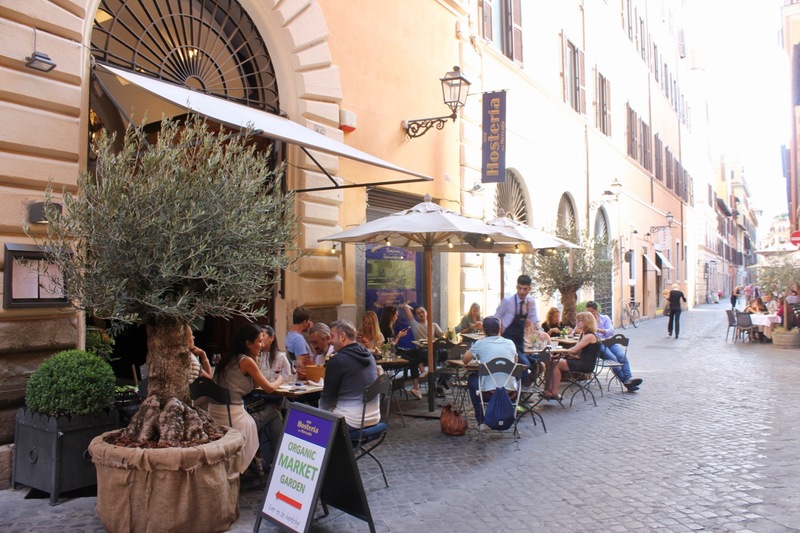 Restaurants Near Spanish Steps - yes, you can eat well! The Spanish Steps area is known as Rome's Shopping Zone. At night it quiets down a lot, and doesn't have a lot of ambiance for after-dinner strolling (other than during the Christmas holidays). Skip to the bottom of this page for a map of my favorite restaurants near Spanish Steps. I've tried many more restaurants near Spanish Steps that I don't include here. In some cases, it's because I find them mediocre, overly-touristy, or just not memorable enough to go back. The places on this page are among my favorites - most for the food, and a few for the special ambiance, where noted. When I think of restaurants near Spanish Steps, it's for lunch. I think that's because it's the meal I eat most often in this area of Rome. It's where I find myself meeting friends, trying new places, and going back over and again to the best ones. These are my favorite spots for lunch. You can, of course, eat at most of these spots for dinner as well - just note the opening hours. 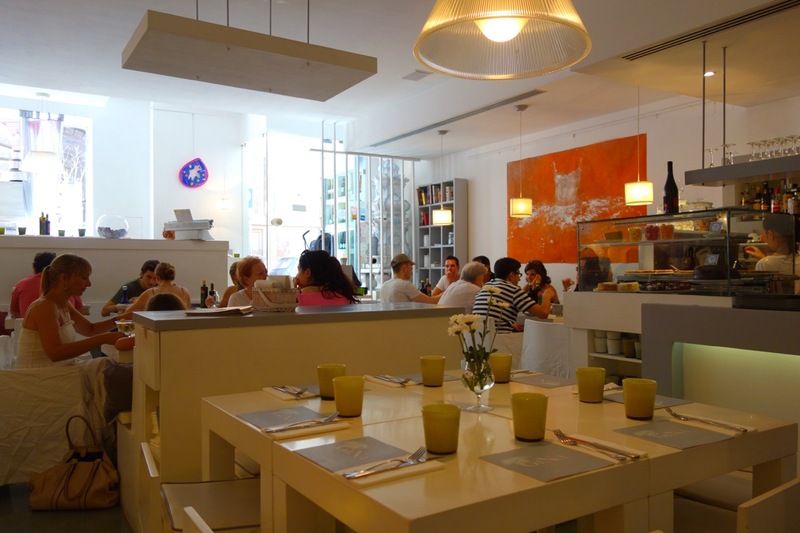 Gina is one of the best restaurants near Spanish Steps for a salad or other light lunch. They are not a trattoria, and they don't have big main courses. What they do have is a clean, bright cozy atmosphere (think white shabby chic minimalist), an amazing array of "big salads", and lots of other light dishes like fresh panini, cold pasta plates and oh yeah, those not-so-light desserts . . . rich layered chocolate cake and cheesecake, among others. This is an excellent place for eating light and healthy in Rome. It's also got lots of options for vegetarians and vegans. Gina also prepares to-go picnic baskets, along with straw rolled mats, so you can go have a picnic in the Borghese park nearby. You should order in advance. Address and phone: via San Sebastianello , 7/A; tel: 06 6780251; reservations strongly recommended, especially on weekends in high season. No outside dining. La Buvette has been one of my go-to lunch restaurants near Spanish Steps for years. 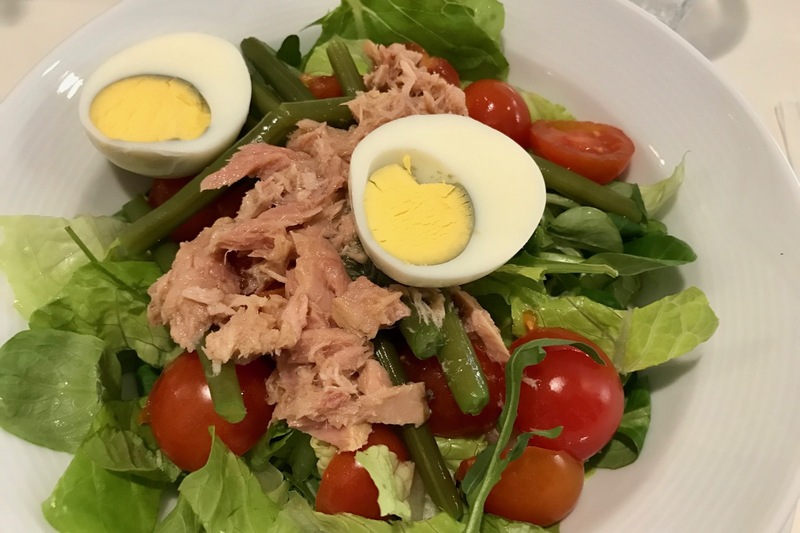 It's not even that special food-wise, although I always like everything I eat there, like cous-cous seafood salad, tagliatelle with truffles and their gorgeous salade niçoise. I just like the atmosphere, sitting outside but not in chaos, sipping a glass of wine with my lunch, and watching the Roman shoppers go by. It can be tough to get a table at prime lunch hour during nice weather, because it's one of the few places you can have a nice lunch outside near the Spanish Steps but not be inundated by crowds and tourists. Try going on the early side, like noon. Address and phone: Via Vittoria, 44 00187; tel: 06 679 0383; reservations not accepted. Outside dining available. How would you like to eat lunch inside a wine shop, surrounded by gourmet foods and bottles of wine, eating some simple, homemade Roman food? At first glance, Buccone seems to be a wine emporium, but look near the entrance and you will spot the daily specials written on a little chalkboard easel. This is one of the best restaurants near Spanish Steps for a cozy, simple, homemade lunch. They also make their own crostate, or fruit jam tortes, daily. Simple and delicious! Address and phone: Via di Ripetta 19; tel: 06 3612154; reservations not accepted. No outside dining. Restaurants Near Spanish Steps - Big buffet, with outdoor tables to boot! Alla Rampa is may be one of the best overall choices of restaurants near Spanish Steps for lunch: they have a fabulous, varied buffet with excellent fresh food; you can sit outside, and in the shade during summer; and the waiters are all old-school, so a bit funny, friendly and always professional. They have a regular menu with plenty of Roman specialties as well. But the lunch buffet for 11€ (not including beverages) is a real bargain. It's valid for only one trip to the buffet, but I have never been able to eat more than one plateful anyway. My lunch plate at Alla Rampa, more then enough for me! Address and phone: Piazza Mignanelli, 18; tel: 06 678 2621; reservations accepted but not necessary. The view from Caffè Ciampini at the top of the Spanish Steps. Not too shabby! The Ciampini I am referring to here, which was opened by one of the sons, is at the top of the Spanish Steps, on Piazza Trinità dei Monti. And the reason I recommend it for lunch is not for the food (which is fine but not that special.) It's for the ambiance, the turtle fountain and the view. What a lovely ambiance for a quiet lunch (with a view) at Caffè Ciampini. See the fountain in the middle? There are turtles in there! Address and phone: Piazza Trinita dei Monti; tel: 06 678 5678; reservations accepted but not necessary. Do you really want to eat where the Romans eat? It's not always about the rustic trattoria with the old-fashioned waiters and the fried artichokes. Modern Romans flock to Ginger for its bright, cheery atmosphere, and hip selection of fruity healthy choices on the menu. They (and I) love the giant fruit concoctions, smoothies and cheese plates. It's a great spot for vegetarians and vegans, too. Ginger also serves some traditional Roman pastas so there is something for everyone. Ginger is one of the restaurants near Spanish Steps very popular with the modern Roman crowd. Address and phone: Via Borgognona, 43-44; Tel: 06 6994 0836; Reservations accepted but not necessary. Hours: Open daily from 10am - 11pm. This is another one of those restaurants near Spanish Steps I only come to for lunch, although I am sure breakfast and dinner are lovely too. What I love the most is feeling like I'm sitting outside, even when I'm inside. I am not a big fan of outdoor dining in Rome (with some exceptions), because of cigarette smoke, heat, street vendors and car/scooter exhaust. Sitting inside Hosteria del Mercato is like an oasis, year-round. But I wouldn't come just for that. It turns out the food is excellent too. The menu is all about biological, sustainable ingredients. It's varied, with something for everyone, including vegans and those avoiding gluten. Top it off with a pretty good wine list, and superb desserts, and you have a winner! Bonus - they also have a bio food market next to the café inside. Address and phone: Via Bocca di Leone, 46; tel: 06 .06.69.92.3705; reservations suggested. Outside dining available. Rinascente is one of Italy's biggest department stores. They recently opened their flagship store, to great fanfare, right between the Spanish Steps and Trevi Fountain. Why is a department store on a page about restaurants near Spanish Steps? Because they have a huge, beautiful food hall on the top floor! With tons of options for everyone. Of course you can also have lunch at any of the below restaurants as well. But I know a lot of people want to eat at an authentic, non-touristy Roman trattoria for dinner, and these definitely fit the bill. Settimio all'Arancio is one of those old-time, traditional Roman trattorias where the fish is on display on ice when you walk in, the owner is sometimes eating lunch alone at one of the tables by the cash register, and, at a late lunch hour, you see all Italian businessmen in suits discussing something important while using their hands to make their point, between forkfuls. Settimio is one of a family of 3 siblings that own three restaurants in Rome, with this one being the oldest. You can have everything from typical Roman pastas, to in-season-only artichokes, to seafood to steak. A good wine list and courteous, professional waiters round out the experience. Address and phone: Via dell'Arancio, 50; tel: 06 687 6119; reservations strongly recommended. Outside dining available. Arancio d'Oro is run by Settimio's brother, and around the corner from them. This is fantastic Roman trattoria dining in a simpler fashion, but just as good as big brother. The restaurant is more casual, the dishes are a bit less expensive than at Settimio and it always feels like you are eating with locals who live just upstairs. Arancio d'Oro also has a wood-burning oven, which means superb focaccia as your bread option but it also means you can have an excellent pizza here! For more places to have pizza near the Spanish Steps, see below. Address and phone: Via di Monte D'Oro, 17; tel: 06 686 5026; reservations recommended. Outside dining available. The third sibling of this family is Mara, who with her husband runs the wonderful Piccolo Arancio near the Trevi Fountain. It's another one of my go-to restaurants in Rome. Al Gran Sasso doesn't seem that interesting from the street, but they serve excellent Roman and also Abruzzese cuisine, at very reasonable prices. The upstairs has very little space and few tables, but there are more downstairs. Address and phone: Via di Ripetta, 32; tel: 06 321 4883; it's a small place and reservations are pretty much a must. No outside dining. Otello Alla Concordia is a simple trattoria serving all the classic Roman fare: amatriciana, cacio e pepe, artichokes, fried zucchini flowers, lamb, etc. The food is fine, the prices are pretty good, and it's in an excellent location just near the bottom of the Spanish Steps. I am not giving it a rave review but do include it here because it's a consistent crowd pleaser. Address and phone: Via della Croce, 81; tel: 06 679 1178; reservations not accepted; No outside dining. Nino is a classic Tuscan restaurant in Rome. They have all the typical Tuscan treats like white beans in olive oil, ribollita, pappardelle with hare sauce, and of course Florentine steaks. Nino was the "it" spot in Rome for the posh crowd in the 60's and 70's. I just like it for the dark, cozy old-fashioned ambiance, with the high wood-paneled walls, the waiters in their white jackets and ties, and the yummy food. A tad on the expensive side. Address and phone: Via Borgognona, 11; tel: 06 678 6752; reservations recommended; No outside dining. Il Brillo Parlante is one of those restaurants near Spanish Steps you go when you have a larger crowd; when you are not sure where else to go; when you want to eat when other restaurants are closed (in August, or late at night, or Sunday). The food is ok (I do love you can get a mini-pizza as I often cannot finish a whole one), but we go just because it's often an easy choice for a group. Address and phone: Via della Fontanella, 12; tel: 06 324 3334; reservations recommended but not necessary. Outside dining available. Finding good pizza in the Spanish Steps area is pretty difficult. It's just not the area of Rome known for this. This is definitely the spot for thin-crust Roman style pizza near the Spanish Steps. I listed them above as one of my favorite Roman trattorias in the area, but they are also perfect for pizza. They have all the fried appetizers we love to eat before pizza, and I recently discovered they make gluten-free and vegan pizzas too. And they have outdoor seating. They really have it all! Address and phone: Via del Leoncino, 28; tel: 06 686 7757. Reservations recommended or get there when they open at 7pm. And, surprisingly, they make very good pizza. If you really want to hang with the (posh) locals, in a hip, vibrant yet tiny spot right near the Spanish Steps, this is it. Address and phone: Via del Leoncino, 43; tel: 06.681.35108. Reservations accepted. Outside dining available. 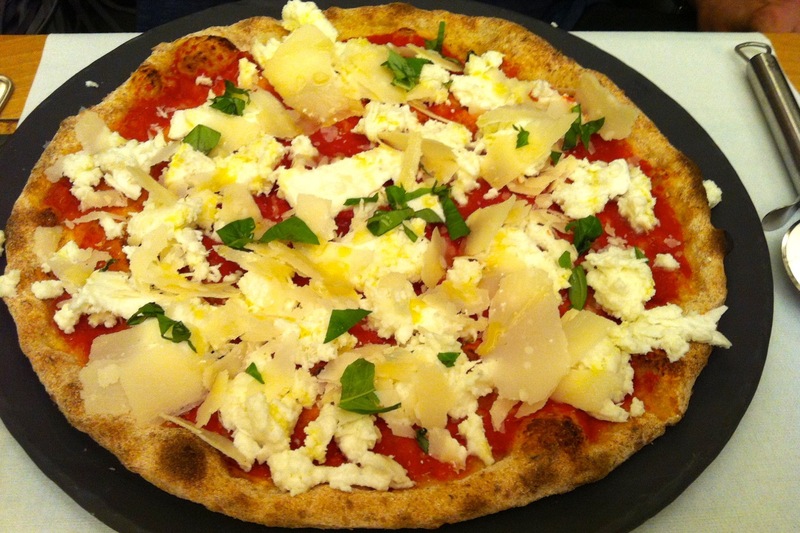 Want to know about more places for pizza in Rome? Check out my page all about this here. If you're looking for romantic places to eat in Rome, you'll find an excellent selection around the Spanish Steps/Piazza del Popolo area. Of course, many of these involve Michelin-star restaurants or 5-star hotels. But not all. RistorArte Margutta is one of the restaurants near Spanish Steps you can enjoy for a lot of different reasons: the menu is vegetarian (vegan also available), with the best organic products; they have a nice open, modern space inside, and cozy tables outside for enjoying in nice weather. And, they have a great brunch buffet. The brunch buffet is actually available daily from 12:30-3:30pm, So we could put them in the lunch category as well. Oh yeah, and free wifi. The brunch buffet food is varied and fresh, and during the evening, you can also enjoy more traditional dishes from the menu. Address and phone: Via Margutta 118; tel: 06. 32650577. Reservations recommended. Here is a map you can open to see all the places I recommend on this page. You can select one of the four categories above to see only those restaurants. 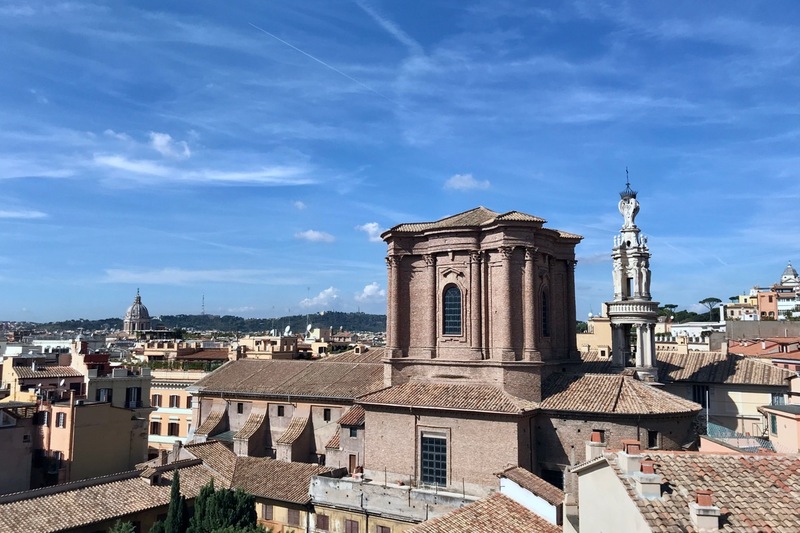 All are within easy walking distance of the Spanish Steps and Piazza del Popolo.